Provide comfort for the family of Catherine Novicki with a meaningful gesture of sympathy. Catherine Panos Novicki (Bette) of Wellesley Hills, formerly of Dedham, died from complications of Alzheimer’s. Bette was predeceased by her husband, Anthony J. Novicki. She was the most amazing mother of Joe Novicki (Beckett Dent) of Walpole, Kathryn Novicki (Charlie Baumeister) of Wellesley Hills and Christina Novicki (Mark DeBlois) of Sherborn, and sister of Peter Panos of Wellesley Hills. She will forever be missed by the loves of her life, her grandchildren, Fenn, Sam, and Henry Novicki and Lily and Teddy Baumeister. Bette faced Alzheimer’s as she faced everything: with dignity, strength, courage, feistiness, and a little bit of denial. She loved her children and grandchildren fiercely. She treasured her friends and always found ways to laugh and have fun, even when she could no longer leave her bed. She pushed herself to always be better: as a mother, friend, cook, at bridge, or at raising money for her children’s schools or for the charities on which she worked. Her most favorite place to be was with her family, her children and grandchildren or with a good book. She spent the last years of her life with all of those things and died surrounded by the books which she voraciously read. Memorial service will be held Saturday, March 23, 2019 at 11am, St. Paul’s Church, 59 Court Street, Dedham. In lieu of flowers, a donation in her honor may be made to support the Innovation Fund at Dedham Country Day School. DCD was a special part of Bette’s life. She was a trustee for many years and volunteered in many capacities, and it is where she met some of her closest friends. All three of her children attended and two of her grandchildren currently attend DCD. To plant a memorial tree in honor of Catherine P. Novicki, please visit our Heartfelt Sympathies Store. 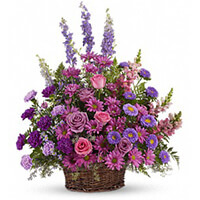 The Amherst College Field Hockey Program purchased the Gracious Lavender Basket for the family of Catherine Novicki.